Fun and Easy Treats for Memorial Day!! So, I may not have mentioned this yet, but for the past week, we have been moving. In case you haven’t moved lately, it’s pretty much the worst thing ever, especially when you’re pregnant and it’s 95 degrees outside. It makes me feel murderey, so it’s probably a good thing that I have a huge fear of blood and prison food. I spent the past weekend getting my kitchen in order so that I can bake all kinds of life changing desserts this week. But for today, because I’m tired, my feet hurt, and if I look at another box I might hurl, lets go over some stuff I’ve made in the past that would be perfect for a Memorial Day get together. This Cherry Limeade Pie is one of my all time favorites. And because it’s in a jar, you can prepare them ahead. Just pop lids on and keep in the refrigerator until ready to serve. 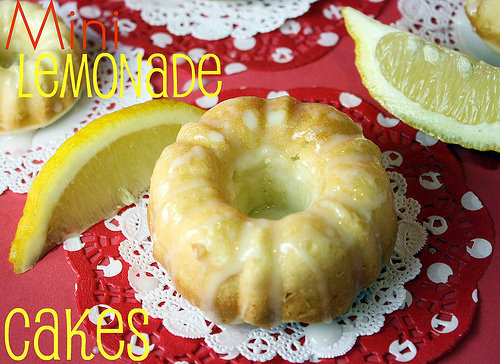 These Mini Lemonade Cakes are topped with a tart glaze and are absolutely adorable. Mini cakes also taste better than normal sized cakes, true story. 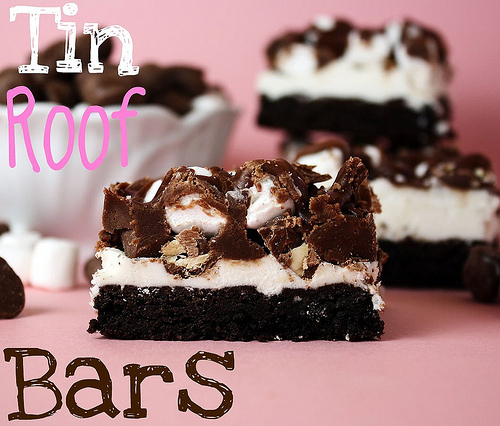 Tin Roof Bars. Because some days call for chocolate, frosting, marshmallows, and peanuts. They just do. 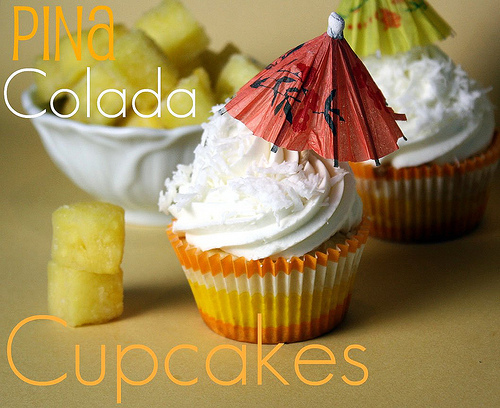 If you’re feeling tropical-ish, these Pina Colada Cupcakes will hit the spot. Crushed pineapple and cream of coconut make them extra yummy. Cocktail umbrellas are NOT optional. 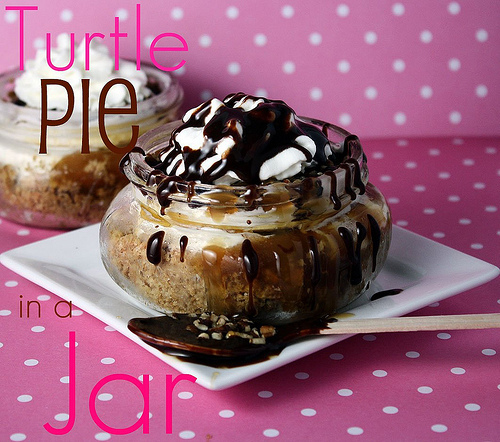 Frozen Turtle Pie in a Jar. Again, make ahead and pop them in the freezer. Everyone will love you. Unless you’re mean, in which case, no amount of pie will make up for that. Lemon Meringue Cookies. In case you’re feeling fancy or don’t want to mess with pie crust. These are awesome!! I hope this gives you plenty of inspiration for your Memorial Day get together!! Enjoy and have a very happy Monday. The mini lemon cakes look so good! I love lemon and the mini size makes them even better. I think anyone can feel murderey when it is 95 degrees out! Oh, you poor baby. MOVING! Aaagggghhhhh! The worst thing EVER. That’s why I’ve lived in the same house since 1970. I’m never moving again. I hope you have wonderful new neighbors who knock on your new door with smiles of welcome, carrying apple pies. How can it be 95 degrees F? It’s not summer yet, right? oh i can totally relate to the pregnant and moving thing. we moved recently while i was about 7 months pregnant. and we were literally moving down the street (less than 1 km away) and so we decided to save money on a rental or moving service. my husband and i CARTED everything slowly until the job was done. it took about 6 trips and definitey was not something i woudl do again haha. the turtle pie looks AMAZINGGGGGGG ! love the idea of being able to refrigerate them until they can be eaten :) great inspirations! It’s so hard being pregnant in warm weather! I had two fall babies, summers weren’t fun. Didn’t like being in a bathing suite! Good luck with the move! Loved these pictures, especially the cookies! Good luck with the move! Hope it’s over with soon and you are rewarded with a place that is bigger and has cleaning fairies to do the housework for you. Moving again! Didn’t you just move into town, in a neighborhood where no one brought you fresh baked muffins? Hopefully the new neighbors are more welcoming! When we moved into our house I expected the same thing and was dissapointed when no one seemed to care we had arrived to the neighborhood. So I threw myself a party. I had a housewarming party and invited a bunch of friends/family … and then I went to all the neighbors, knocked on the door, and invited them to stop by as well. It was hard, so hard, but they were nice… well mostly nice. Some of them showed up (and brought gifts!) and I have barely spoken a word to them since. Sometimes neighbors are overrated. Call me weird but I love moving, though I never had to do it while pregnant and so soon after just getting settled as you are having to. Best wishes with this move Kristan and I hope you will be very happy in your new home. I LOVE the pics of all these mini desserts! I love your blog! Oh, I remember the murdery feeling one gets from moving very well. Good luck with all that. OMG, moving period makes anyone feel murderey, but especially while pregnant. We moved during both of my pregnancies and the only good thing from that is you don’t have to do any lifting. I think it’s perfectly justifiable to sit in the corner with some fruit roll-ups and watch as someone else unpacks. Ok, I apologize in advance but I HATE YOU!! I’ve gained 10lbs. I blame you and your suspiciously delectable, scrumptious recipes. NOW there are LEMON mini cakes? My scale is going to read 9-1-1! But thank you, from the bottom of my growing behind, I thank you! Moving has to be my least favorite thing in the whole world. The only things that makes it better are treats like these and being done. Hope you don’t much moving left to do!! Moving when pregnant is no fun. We moved when I was 7 months pregnant with Ella and I thought I was going to die! We are moving in a month (just moved in Nov too), and I am really NOT looking forward to it. At somepoint here I should really thinking about packing. Love the lineup – desserts in jars are my favorite, they are just too darn cute! I want to make them ALL and your photos are so cute and inspirational for me. Thanks for sharing with us. These recipes all look delish, Kristan! Wishing you continued luck on the move, too! While my husband and I moved from CA to TX last summer, I swore if I heard the shrill shriek of packing tape one more time, I would go bonkers. Ah, the joys of a new home! Thanks for sharing. Also, I’m having a ChicWrap giveaway today that you should enter! awesome recipes for the holiday weekend! good luck moving! :) i hate moving too! since i`m in college i move to a new place every year…and i have a lot of stuff. it`s a pain that the moving process is always over the summer too. SO, i totally understand. :) well, but you`re also pregnant…ahah so that makes you more awesome for being able to do all that! didn’t you just move less than a year ago? I moved pregnant too…nothing worse! 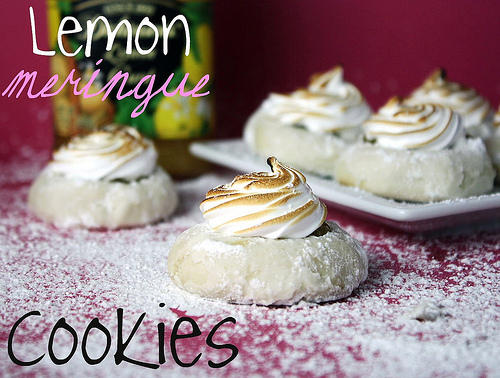 I REALLY neet to try the lemon meringue cookies~very soon! Hang in there, Kristan! These all look amazing but the lemon meringue cookies look AH-MAZING. Cannot wait to make this sometime! I had no idea that you were moving. You better be taking it easy! Good luck with your move! I remember you wanting to do that last year!! I agree with Amy, hope you take it easy. All of these desserts look so yummy! I hope you get to enjoy the holiday even though you’re moving. Moving is stupid. The end. 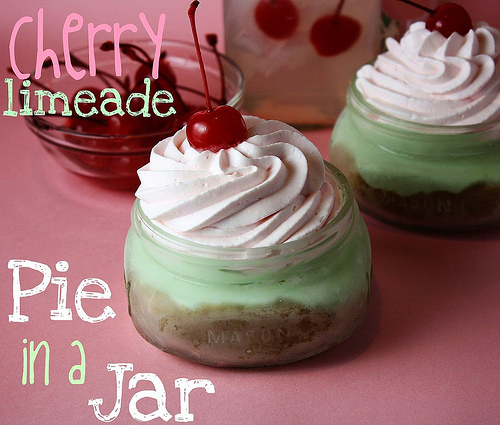 Cherry limeade pies? In a jar? Not stupid. You can take a long break from unpacking and come make me some… Just a thought. You sure have a thing for moving in the summer! Remember, you’re pregnant AND allergic to nature….milk it! Pingback:	Friday Fun!! Friday Fun!! Everything looks so good I’m not sure what to try first. I think it may have to be the lemonade cake though or tin roof. I always enjoy popping over to your whimsical site. There’s always something fun and delicious your cooking up. Your baby is in for a nice treat when he/she arrives. Oh my goodness, I’m pretty sure I just drooled all over myself reading this post. The Tin Roof Bars…I think I’m in love. You sure have a thing for moving in the summer! I had no idea that you were moving. Moving when pregnant is no fun. Also if you’re not a fan. It was a very good post indeed. Cannot wait to make this sometime! Will surely come and visit this blog more often. I will be giving this a go the first chance that I get.